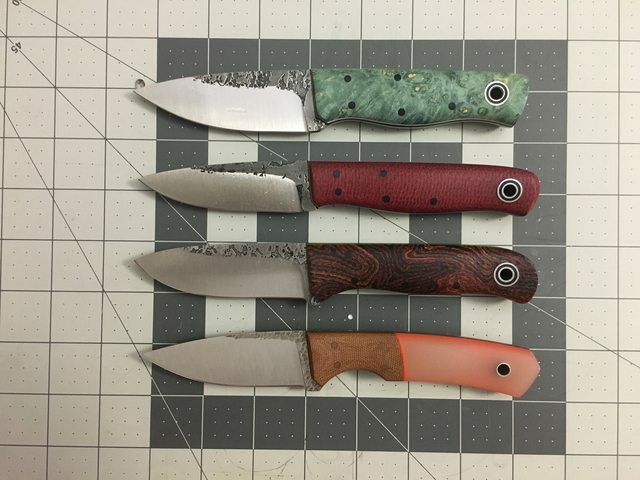 Discussion in 'Fiddleback Forge Knives' started by Justme33, Nov 2, 2018. Trying to decide on my first fiddleback. I am looking to get a knife for hiking and light camp chores. Does anybody have both of these knives and how you use each of them? The only thing I'm not 100% thrilled about is the inability to use a ferro rod on the spine. Any other models I should be thinking about? Thanks in advance! Bush Hermit or one of the Mid Size Hermits would be IMO the perfect knife for what you are looking to do. Between the two you mentioned, I prefer the Handyman. If you have no striker for your ferro rod you can just use the edge of the knife. Unless you plan striking the blade 1000 times in a row on the same spot you'll be fine. A few strikes on the rod can be cleaned up with a little stropping on the pant leg. Curl of the Burl, blue333, Bmurray and 1 other person like this. I guess it would depend on what you consider “light camp chores” and whether that also entails any wood processing and, if so, whether that means simply making a few feather sticks or also batoning/splitting. The “trouble” is, FF makes an enormous number of models that could work well so you can really dial it down to what feels best in your hand. On the larger end (~4” blade) the already mentioned Bush Hermit is an awesome choice. On the smaller side (3.25+”) any of the Hiking Buddy, Handyman, Bushnub models are excellent. There are many more, of course. I would note that the Bush Hermit and the Handyman both have - to me - some of the best handles I’ve ever experienced. The Bush Hermit is and feels considerably larger (taller in both the blade and handle). For hiking I prefer as small/light as possible. Lady1911, Southern Gent, Wurrwulf and 1 other person like this. Here is a comparison pic of the Bushnub (guardless version = better IMO), Handyman, Bushcrafter Jr., and Osprey Knife and Tool Warthog. Of those four I only own a Warthog of my own at the moment. This picture was taken during the process of making this thread. I got to handle all of these models and compare them. You can read my thoughts on them in that thread. I will say, now that some time has passed, I'm getting a Handyman from the scandi group by and would love to get one of the new medium sized Bush Hermits, the Loner, at some point. Looks like a great knife for exactly the tasks you're looking to do. As for ferro rods, I've never found that to be an issue. I think striking with your knife can be dangerous, especially in poor weather conditions with cold hands. It's easy and light enough to carry a small piece of hacksaw blade to strike ferro rods. Or just get an "all in one" like the Nano XL from Exotac. Outpost Allison and Oyster like this. as @Southern Gent stated, the Bush Hermit is the perfect all around knife and also the Buschcrafter. They can handle the small details to the larger work. Also a dremmel tool can easily grind a notch on the spine for a fire steel just do it around the upper 1/3 of the blade. Speaking from personal experience, don’t overthink your decision too much because you will most likely end up with several Fiddlebacks after your first. As stated above, if you prefer a smaller knife, can’t go wrong with any of those options. Hermit and Bushfinger are awesome all around mid sized knives. For my first purchase, it was more handle scales that drove my decision. 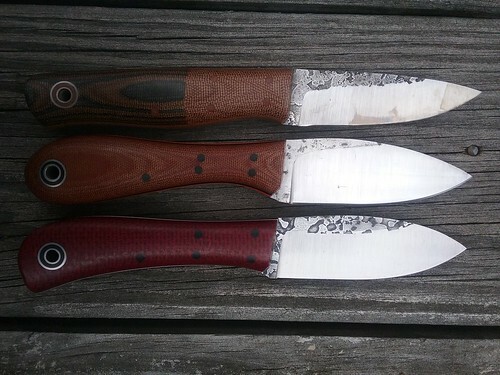 I knew I wanted one the smaller 3” blades and an awesome natural bolstered navy burlap Hiking Buddy came up on Fiddleback Friday. Currently, I use a Handyman and Osprey Warthog for my smaller knives. I really like the extra bit of handle on the Handyman. Lady1911, Oyster and pertinux like this. My uses are every day chores and some food prep (not outdoor / camp) but you have to consider that the Bushnub will give you a bit more handle height but slightly less length. Also, the green Bushnub above is an Old Style Bushnub / guardless and there's the Bushnub II / guarded version to consider. The blade on the Bushnub II isn't as tall either. A lot of folks looking for outdoor use like having a guard so don't overlook that you might be considering Handyman vs Old Style Bushnub vs Bushnub II. I concur that you'll probably end up with a few. Mr. Murray's name is "Bob" for a reason. He sometimes like to shorten his knives a smidge. I am betting that if you ask real nice, Andy might be willing to flatten a spot on the spine for you. Bmurray and Lady1911 like this. For a first fiddleback 3 1/2" knife I would pick a 1/8" TT Handyman it is the all around winner for me. I have a 3/32" Bushnub that I like and carry a lot as an EDC but for me leans towards food prep where as the Bush Hermit loner (Med) leans towards fire prep mine is scandi grind so even more. The Hiking Buddy is sort of a smaller lighter more nimble all around 3 1/2" knife. The Bush Hermit and Bushcrafter are great 4" options. Scotcha and Oyster like this. Speaking from personal experience, don’t overthink your decision too much because you will most likely end up with several Fiddlebacks after your first. +1000% on this. There are a lot of reviews on most fiddleback going back years in the FF Forum and I would suggest plowing through a few. Figure out what uses the reviewers and you share in common and pull the trigger on that Fiddleback. Repeat as necessary. And Fiddlebacks are essentially bombproof so users can easily be cleaned up or kept patina'd as you see fit trying multiple fiddleback. I wouldn't buy any modified ones, too much risk. Another knife in this size range I would recommend is the EDC/EDC2. I personally prefer the leaf shaped blade style. CAD, Bmurray, Scotcha and 1 other person like this. I agree 100% with all of these choices! And if you ever want to part with that beautiful Lil Lady....well, you know the rest. Tough call. My decision would be guided by what I think would be more comfortable in hand. For me, the shorter but taller handled bushnub would be the choice between those two. That said, If it were me, I would jump up one size to the just under 4” bladed Bushfinger (guardless) or Bush Hermit if you want a guard. To me, the extra handle and blade are worth the minor weight penalty. Check out the new Loner! Justme33 and Curl of the Burl like this. I wasn't getting updated on all the posts. Thanks for all the information. The Loner looks pretty awesome! I like the belly of the blade and the handle looks more stout. I don't seen the length on the Loner though. I have heard that even without grinding the spine of the blade, it can still throw sparks. Any experience with this? Thanks again! I also like the original bushnub better! It just seems to flow a lot better.I think I've noticed on the busnhb II that the belly curves in a bit right before the guard, and it disturbs the flow. Thanks Oyster. I have noticed that there are lots of models! I am beginning to see the futility of buying one! Light camp chores for me would be feather sticks, starting fires, and food prep. I will have a small hatchet for the big stuff! Pics and dimensions of the Loner can be seen in today’s Fiddleback Friday thread. First one I’ve seen and it looks great!